MIO Law Firm was established in 1985 in Abu Dhabi, UAE to provide litigation and legal consultancy services; bringing the wealth of experience of their legal expertise to various business sectors. 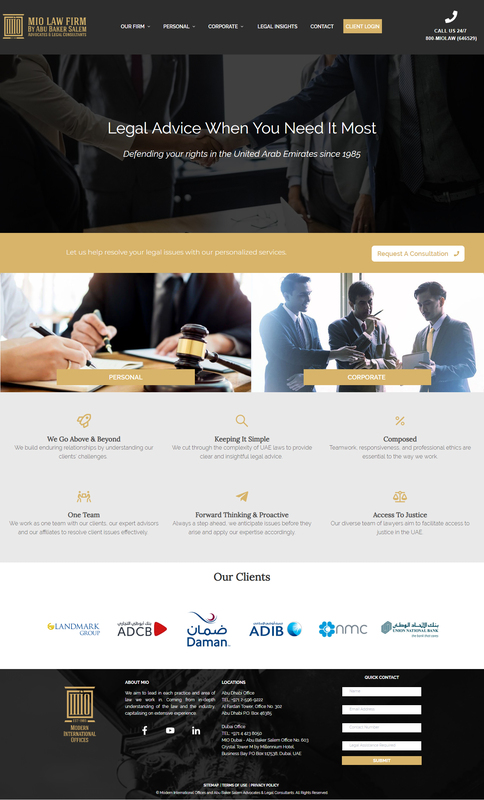 Having had a website for years that did not showcase their legal expertise and professionalism, they hired Tahawal to give their website a revamp and reflect their current brand. We also mapped out a customer journey to ensure that all potential customers are led into the contact page naturally. Each element of the website was planned, reviewed and implemented with finesse – from content to the shades of gold. The overall goal of the website was to make it B2C oriented and avoid intimidating the common person with jargon. The overall result was a success – a brand new shiny website with over 25+ new pages that encompass all their services and include a blog section which will aid in content marketing to help reach current and potential customers through relatable blogposts.